Imagine hugging your family, cats, friends and significant other knowing it’s the last time you will see and communicate with them for 60 days. The next day you are waking up in one place to the sounds of birds and scurrying insects, knowing that those back home are getting ready to go to sleep for the evening. Imagine interviewing farmers and other individuals by overcoming language barriers and gender role stereotyping. I explored the agriculture industry at the grassroots level. Putting on long pants and dri-fit tops for the hot day ahead, spraying bug spray in frantic protection from malaria-ridden mosquitoes, and continuously applying sunscreen became my norm for two months last summer. It continued over winter break as I ventured into the varied landscapes and forests that comprise Costa Rica. If my internship at the International Centre of Insect Physiology and Ecology in Sub-Saharan Africa or my field reporting course in Monteverde, Costa Rica, taught me one thing, it would be that agriculture is truly international. Future job-seekers must be prepared for the globalism that encompasses the industry. Of course, agriculture is international. From the citrus fruits that arrive in our mid-Missouri grocery stores out of growing season, to the swine and poultry products shipped to and from our country, to the international trade that occurs each day. It is easy to see that the industry many College of Agriculture, Food and Natural Resources students wish to enter upon graduation is diverse with an international web of connectivity. The ever-changing globalized food system can make knowing where the food prepared at home or from the fast food chain down the street comes from a challenge. Food travels and is eaten in all parts of the world. Knowing about a different country’s agriculture and food production systems gives you a competitive advantage in the job market. From Argentina to Thailand, Costa Rica to New Zealand, CAFNR recognizes the importance of preparing students for the global workforce. Far too few students stretch out of their comfort zones and participate, even if for just two weeks over a school break. CAFNR currently provides 14 cultural immersion programs, offered over summer and winter break, plus fall and spring semesters. Emma Downing, an agricultural economics major at the University of Missouri, recently ventured to New Zealand over winter intersession. 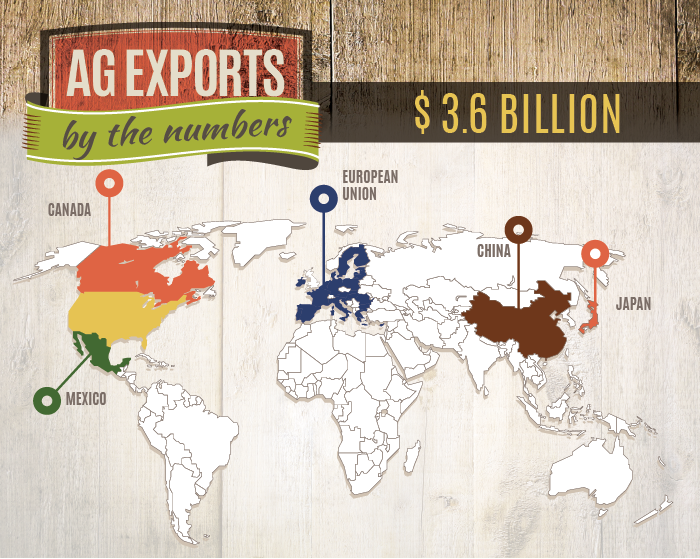 According to the Missouri Department of Agriculture, our food product exports reached $1.56 billion last year and agriculture products reached $376 million. The diversity within the agriculture industry requires upcoming professionals to have knowledge about our international partners and to be able to apply it to real-world experiences. From my time abroad, I am better able to discuss Costa Rica, Kenya and Uganda, and their respective food production landscapes, with others. Not just from reading a textbook or Googling behind my computer screen. “The reality that a corn crop in southeast Iowa can make the journey across the earth to be consumed by Japanese children blows my mind,” Downing said. It is not enough to simply know about another country. The opportunity provided by study abroad programs to live, learn and immerse in another culture is key to tangible experience that is lasting and impactful on the future of our industry. Education, coupled with international experience, stands out on a resume of an emerging agricultural leader. In Thailand, Hord was introduced to shrimp farming, mangroves, meat and fish markets, rubber production and conservation. Many of their agricultural practices are unfamiliar to those who remain sheltered by the borders of the United States. While in Costa Rica over winter intersession, I reported on food, environmental and agriculture issues that were influencing the Ticos and their livelihood. Day in and day out, I was thinking in a journalistic frame of mind, while soaking up the agriculture industry. It is an enriching situation to think about industrialization and sustainability conflicts, financial problems, and tourism’s impact on food security when you are in a country that operates differently than the United States. In Costa Rica and Thailand, for example, they experience these problems daily. The college recognizes the importance of international education and provides $70,000 annually in study abroad scholarships for undergraduate students. Scholarship amounts range in value from $500 to $2,500. The scholarship deadline passes and many funding sources go unclaimed each year. Funding opportunities are available to students who step out of their Americanized comfort zones and pursue a CAFNR-sponsored study abroad program. As a CAFNR study abroad participant myself, I can attest that the programs are designed to be challenging, authentic cultural immersions. The Costa Rican winter intersession program, for example, is a six credit course where students are expected to report daily by photographing and interviewing sources. Students must expect to meet in a class-setting on campus at MU before the trip and again after the trip. The experience of participating in a course of this caliber and extensiveness is a learning opportunity in itself. Study abroad has made me a better student, scholar and global citizen. In addition to simply the experience of being in a new place and looking at agriculture through a different lens, study abroad deepens personal and professional growth. Domestic lecture courses and family vacations could only dream of an impact this influential. After two months abroad, I am a more confident, well-rounded person. I am a better student, leader and friend because of the experiences and people that I met while abroad. Developing a worldly perspective is invaluable in finding your place in the world, and my two ventures outside of the United States have brought me a sense of purpose, possibility and spontaneity; all of which I was seeking through other outlets with no success. CAFNR, and our agriculture industry’s future, is ready for you to step out of your comfort zone and explore the world around us. If interested in participating in a study abroad program, please contact Shanon Dickerson, director of CAFNR study abroad, at dickersonsm@missouri.edu. I am an Eldon, Missouri, native, best known for being “too busy” and for the circumstances of my birth – I am the only girl in a set of triplets! Born and raised on a family farm, agriculture has always been a large part of my life and growing up, that was not something that I always appreciated as I do now. Since the age of 5, I’ve been chasing big city dreams that led me to pursue a degree in science and agricultural journalism, and hopefully minors in rural sociology, agricultural economics, leadership and public service. I am interested in international food insecurity, policy, nutrition and a whole slew of other topics.